WinPIM 2011 - All-in-one PIM with network solution. There is fierce competition out there in the field of personal information management but WinPIM remains one of the best due to it's simple multi-user system and perfect balance between attractive interface and poweful features. Contact, calendar, appointment and diary are all a breeze to set up and edit (a handy bunch of wizards make sure of this) while offering a superb range of fields to play with. You can create groups and drag & drop freely to organize large of Contacts. 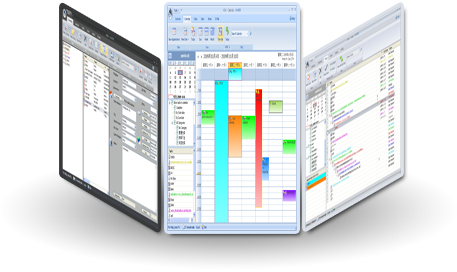 As well as standard links to your browser and other programs, searching and dialer WinPIM can also generate useful summaries for your contacts perfect for printing. The Appointments and the Tasks makes your time usage more productive and more rewarding. The Diary supports rich-text format contents, you can even add more than one diary to one day. And if they aren't enough you can add your own data into the 'information' section which makes WinPIM limitless in what it can store. With WinPIM, you can also send e-mails to your contacts, send appointment, it support HTML e-mail, multi-accounts, and e-mail modules. And with SMS Messager WinPIM provided, you can even send your calendar to your mobile phone. Easily one of the simplest and most attractive PIM programs on the market, WinPIM is perfect for personal use and more than sufficient for most professional users as well. As an added bonus you can download many reminder skins and schedules - oh joy!